Do You Ever Have This Problem??? 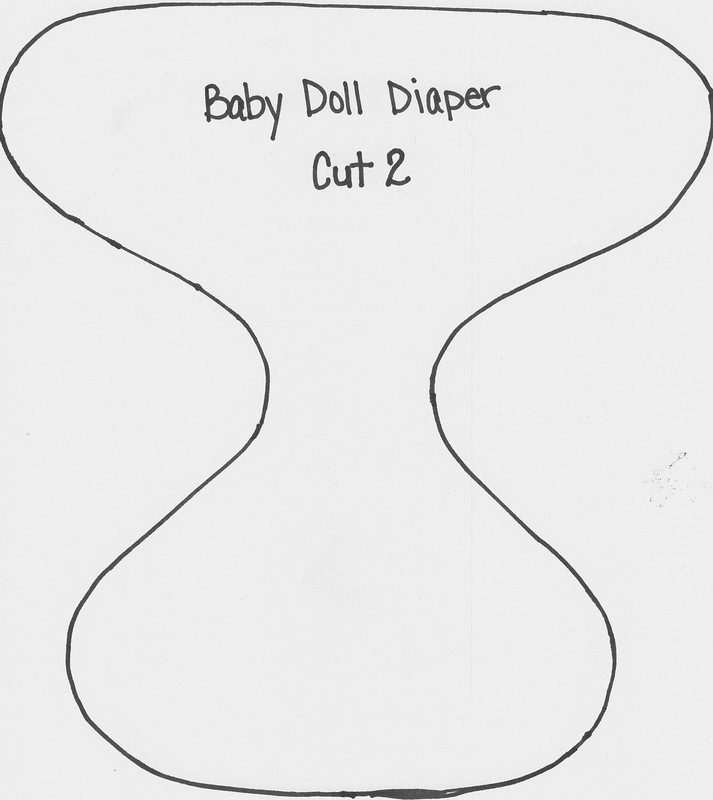 Baby Dolls Need Diapers Too! I won a sewing book a few months ago. Sew Serendipity. It is full of the cutest skirts, dresses, and even a couple coats. I want to make everything in that book for myself! I will not make or buy me any clothes for myself until I lose some weight. But this skirt kept calling me and I was dying to make it. So I made a mini version. It's not exactly like the one in the one in the book. I didn't put the rick rack down the front or the ruffles on the pockets. But I really don't think it needs it. From 3 of the fabrics cut strips 5" x 14". You need TWO strips from each fabric. This will make up the front and back of the skirt. From another fabric cut 4 rectangles. 5" x 4". Next I cut a curved edge on one of the 5" sides. Put right sides together and sew the top and the bottom. Top stitch along the curved edge. Sew the bottom of the pocket to the skirt by top stitching 1/8" from the edge. Repeat for the other pocket. With right sides together sew a pocket strip and the middle strip together just as the picture above. Do the same with the other pocket strip. Iron the seams to the middle. Repeat with the 3 remaining strips for the skirt back. 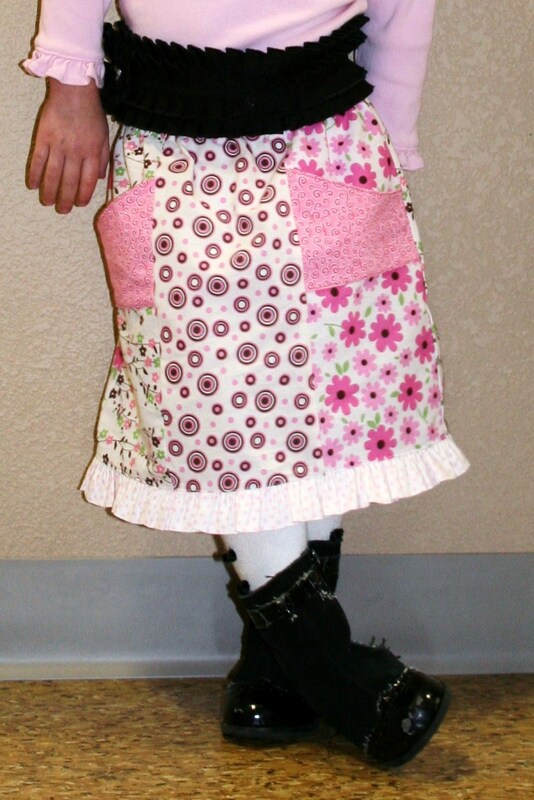 Lay the skirt front and skirt back right sides together and sew both sides. On the top edge fold over 1/4" and then fold again 1". Pin and press. Sew 1/8" from the folded edge. Leave an opening to thread elastic through. Thread elastic through and stitch ends of elastic together. Cut 2 strips of fabric 4" x 30"
With right sides facing sew the short ends together. You should have a big circle of fabric now. Fold in half and iron. On the raw edge gather the fabric. Pin to the bottom of the skirt matching the ruffle and skirt seams. Adjust gathers to fit. Sew. Iron the seam up toward the skirt. Top stitch 1/4" from the ruffle seam. If you make a scrappy skirt I would LOVE to see some pictures!!!!! Both of my kids are growing sooooo fast!!! They ﻿have recently out grown their pajamas. Since I have plenty of fabric and the time I decided to make them myself instead of buying them. Dakota's were real simple. He likes to wear his t-shirts to bed so I made him some pajama pants. He was thrilled!!! He still thanks me (over a month later) for making them for him. Now for Aiyanna I wanted something girly. So I bought a pattern she liked. Grabbed some cute fabric from my stash and got busy. Since I got started after they were asleep and I hadn't measured her since her most recent growth spurt I guessed at the size. I thought about waking her up and measuring her for about half a second. Bad idea! She is one of those kids you don't wake up, even from a nap. So then I thought she wears a size 3 in her clothing so it should be the same for the pattern. Logical right? They are huge on her! Not just a little bit big, or room to grow big, but like 2 sizes to big. Well, I guess to big is better than to small, but it is still irritating. Really I'm frustrated with myself because I know better than to just go by the size. ALWAYS go by measurements. Lesson learned! Be patient and get measurements first. Aiyanna has always loved her baby dolls. She used to love to undress them. Whenever she got a new baby the first thing she would do is strip their clothes off. Now though, she brings me her babies and ask for help dressing them. Her Baby Alive had a disposable diaper that had seen better days. The sticky tabs weren't sticky any more. I had add double side tape to the tabs which pulled the daipers apart when she was changing the baby doll. It was time for new diapers. So I thought I would just make some. It also gave me a chance to use up some more scraps. 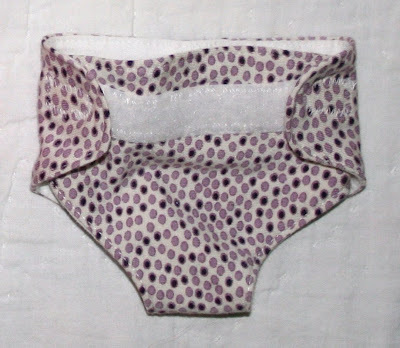 For these diapers I used scraps of t-shirts left over from other projects. It worked great and gives the diapers some stretch. From fabric cut 2 pieces. One for outside and one for the lining. Lay one piece on top of the other. Make sure right sides are facing. If you are using t-shirt (knit) fabric make sure to pin it and use a little bit longer stitch length to prevent the fabric from stretching out of shape. Sew, leaving a 1"opening. Make sure to back stitch on each side of the opening. Clip all of the curves. Top stitch 1/8" from the edge. Cut one piece of loop side velcro 5" long. Cut two pieces of hook side velcro 1" long. I trimmed the ends of the velcro so they were rounded. On the short end of the diaper put the long piece of velcro on the outside. Sew, using a zigzag stitch. On the longer end of the diaper sew the two short pieces of velcro to the inside. Don't you love the pink velcro?! I got it at Joann's. And of course if you make diapers you need wipes to go with them. I have a tub filled to the rim with scraps. They are to big to throw away and yet to small to make something on their own. I save them because I know I'll find a use for them. I use them for appliques mostly. I have challenged myself to get creative and use up some of those scraps. When I was looking through the tub I found a few fabrics that had the same color schemes so I got them out. I grabbed a couple other fabrics with some bright colors and got to work. Cut the fabrics into strips 2.5" wide and various lengths. Sew all the pieces together. No certain order I just grabbed and sewed. Iron all the seams in the same direction. Cut a strip of fabric 2.5" wide and the length of the other (scrappy) piece that you sewed together. Put right sides together and sew. Leave an opening for turning. Iron. Make sure to tuck in the raw edges from the opening. Top stitch 1/8" from edge. That will stitch the opening from turning closed. I liked the scarf I made Aiyanna so much I decided to make myself one. I made mine 3.5" wide instead of 2.5"